It’s Apple time, I love the fall and I love using apples in dishes and warm apple cider. Had a little fall get together with friends this past weekend so I made apple bites. Great fun for the Kids too!!! These are so easy to make, I used Fowler Farms Zestar Apples, we carry apple from this farm and they are by far the best I’ve ever had, just delicious. Hold the apple in one hand and melon baller in the other, scoop out balls of the apple. I put them all in a bowl, then took a paper towel and kind of squeezed the cut side of the apple (because if its too wet the chocolate will not stick) to absorb some of the juice. 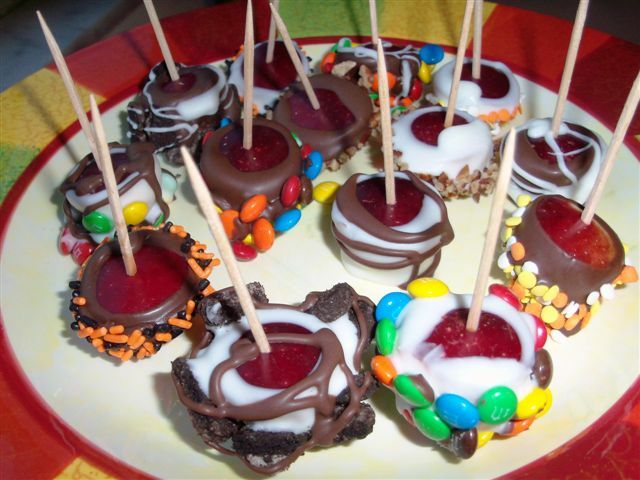 Put a toothpick in the top (skin side), then dipped in chocolate then toppings, set on a tray to cool. You can also drizzle extra chocolate on them too, these will keep in the refrigerator for 2 -3 days. This is great fun to do with your kids and to serve at Halloween Parties or any party.